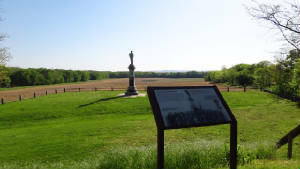 Monocacy National Battlefield is located just outside of Frederick Maryland. 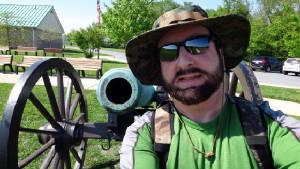 The park is one of the unknown gems of the east and does not get the sheer number of visitors that Antietam and Getyysburg get, so it is unspoiled at this point. 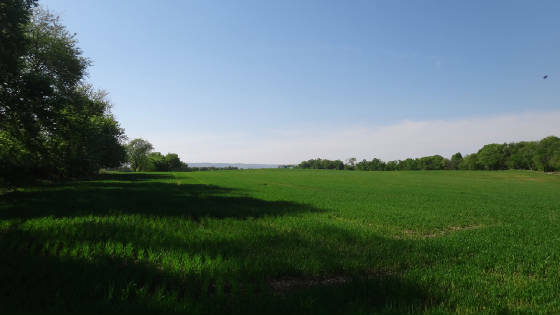 It is a quiet place except that the battlefield is cut across by US270, which can be annoying! There is a brand new visitors center that is open whenever they want to be. 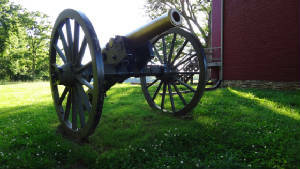 It contains numerous artifacts and weapons from the battle and gives the visitor an idea of how and why this battle happened in July of 1864. The staff is helpful and polite and you will feel like you are the only one there, which you might be at times. 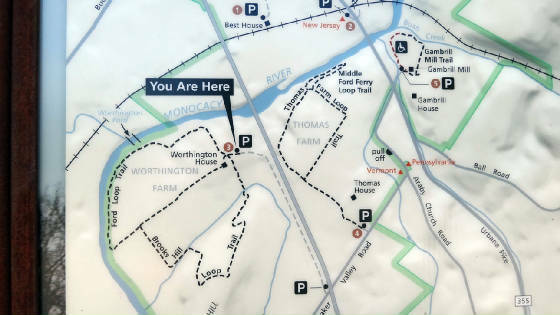 Known as "The Battle That Saved Washington", Monocacy is a forgotten treasure. In 1864 Jubal Early and 15,000 confederates marched up the Shenandoah valley and headed into Maryland on a course for Washinton city. 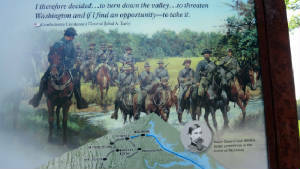 At this time General Grant and General Lee were locked in a struggle for Richmond and Petersburg. Lee thought that becasue Grant had drained his defenses around the capital, he should strike Washington in hopes of relieving his lines around Petersburg, giving him a fighting chance to break the deadlock. 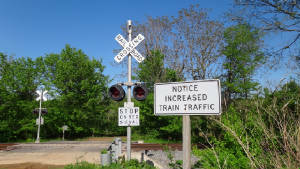 Alerted by the Baltimore and Ohio Railroad presdient that some rebel army was headed toward the city, General Lew Wallace, who had been shunned for his wandering off at the Battle of Shiloh in 1862, made a stand at the railroad juntion just outside Frederick known as Monocacy Junction. In this battle which lasted less than a day, the union forces were able to delay the rebels long enough for Grant to be alerted and for him to send troops from Petersburg to Washington by boat. They arrived just as the rebels were massing outside one of the forts that protected Washington, Fort Stevens. In the Summer of 1864, Confederate Lieutenant General Jubal Early launched a campaign down the Shenandoah Valley with a corps of approximately 15,000 troops. The campaign was a last attempt to carry the war to the north and to relieve some pressure from General Robert E. Lee in the south. 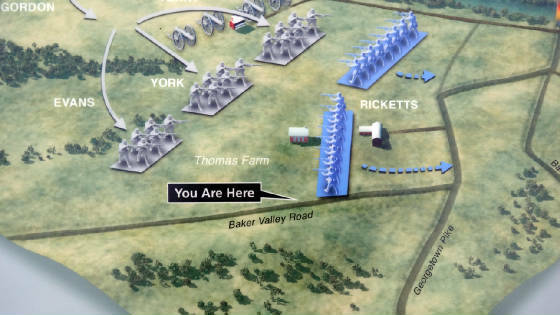 Early’s ultimate objective for the campaign was to march down the Valley, to swing to the east through Frederick, and to attack and capture Washington, D.C. from the north. But apart from the battle, the region has numerous stories to tell. Native Americans have been present in the area since the earliest human occupation of North America, nearly 10,000 years ago. European explorers and traders arrived in the region in the early 1700s. 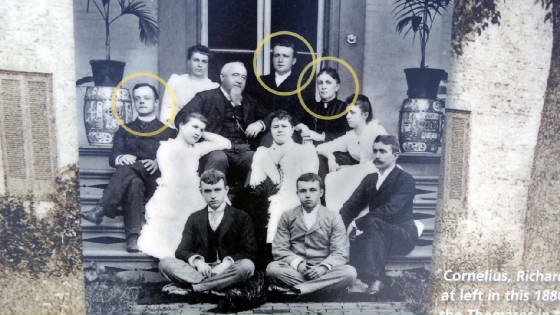 Learn more about the people, places and stories which shaped Monocacy. 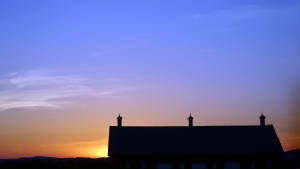 During a recent visit, I stopped at the Thomas Farm to catch the sunset. I took many photos and some came out pretty good, but only one had an anomaly, this one. I say anomaly, as I cannot prove this is anything but that, however my experience with photography and knowledge of the area lead me to believe this is indeed an ORB. We at ghost soldiers do not throw away possible evidence because it "could" be something, instead we chose to examine each anomaly and make our hypothesis based on each set of circumstances surrounding the item. In short, I have taken hundreds of pictures here and this is the only one I have every had that wasn't glare or refraction. Click on the picture to enlarge! 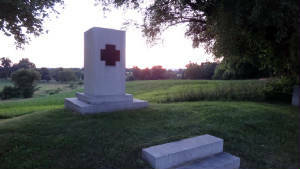 There are several key areas of the battlefield that you will want to visit. 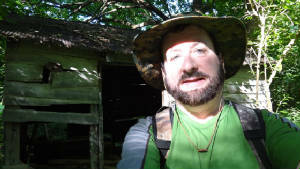 The old visitors center is an old mill, that was the center of the fighting that day and it has a nature trail loop that takes you down by the river and through the area where the union defenses were. It is a fun walk and very nice scenery to look at. 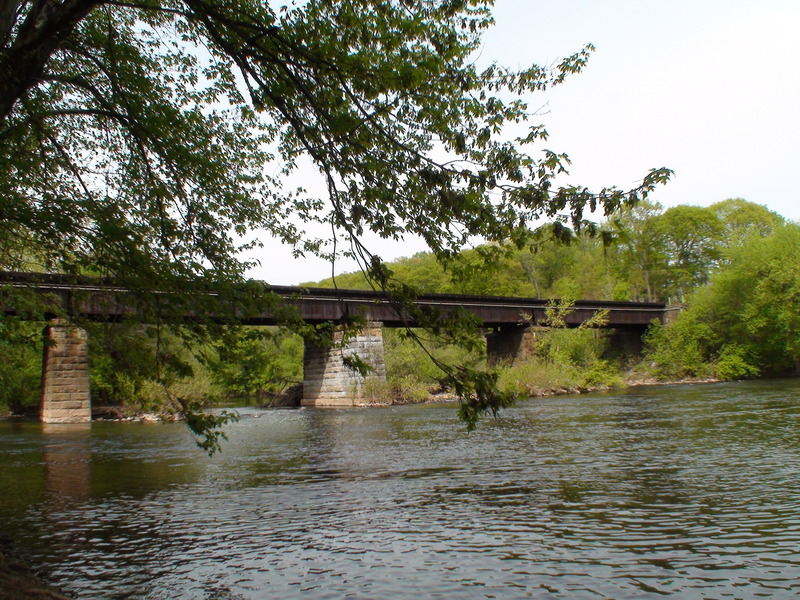 Near the mill is the Railroad bridge. This bridge was there at the time of the battle although it has been rebuilt since then. However, the other bridge, which is now a metal one, was originally wooden and played a key role in the fighting that day. 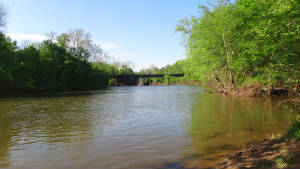 The monocacy river is fairly wide and deep in places, so they needed to take the bridge to get across. Well the officer in charge of the 14NJ infantry decided to burn the bridge in the middle of the battle, before he could tell his men who were on the other side shooting at rebels creeping closer and closer. As the wooden bridge went up in flames, the men who were trapped on the other side panicked and began running back over the railroad bridge, with the rebs hot on their tales. 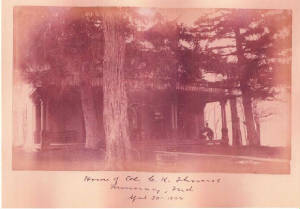 Several of the men were captured or slipped between the ties and fell into the water 4o feet below. So this area is littered with dead soldiers. 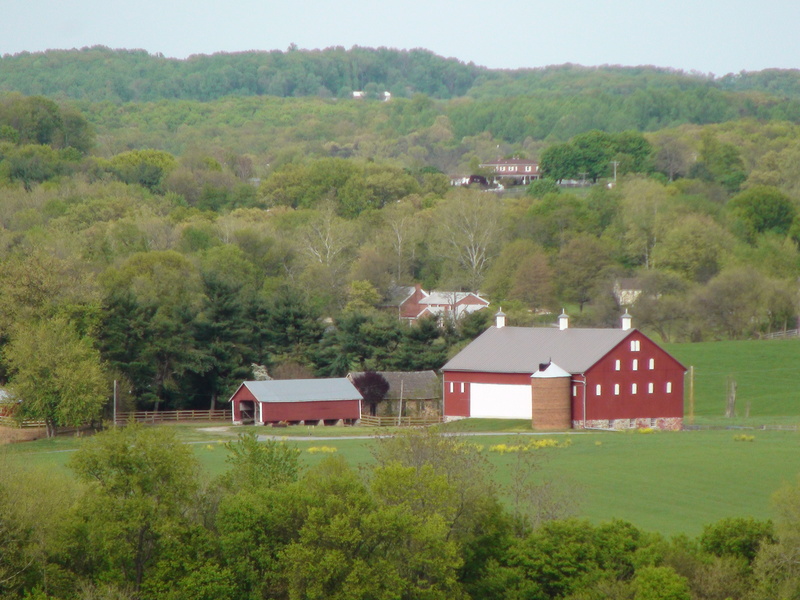 Another area you will want to check out is the Worthington Farm and Thomas farms. These two farms were caught up in the middle of the struggle. 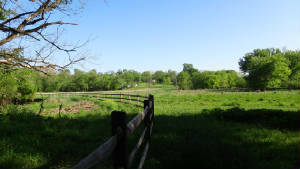 When the Thomas's heard about the rebs approaching, they took their horses and his them near Sugarloaf Mountain, so that the rebs would not commandeer them! 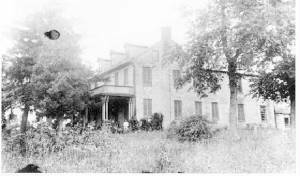 Two of the sons who were on the porch when the union troops arrived, were given guns and told they had volunteered to defend their families home. The funny thing is that the Thomas's were slave owners and sided with the south, now their sons were put in line of batlle, but later released before they could be killed or wounded. Their is a nice pair of trails at the Worthington farm. One takes you down to the river where late in the day of July 9th, 1864, General Gordon crossed with his men to flank the union position. Lew Wallace had only about 5,000 men and most of those were not veterans. 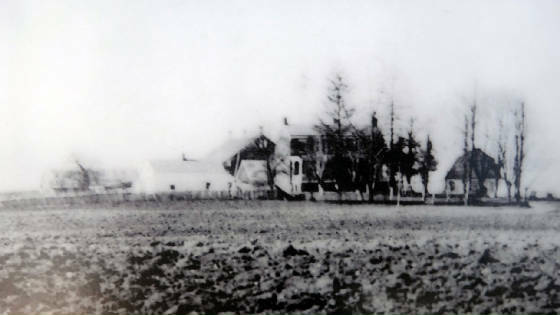 He had anticipated the move and set up a regiment along a wooden fence on the downslope from the farm house. 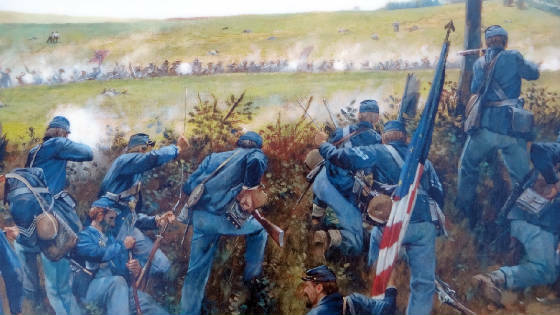 Just as the first troops marched past the house, the union troops rose up from behind the fence rails and deliverd a withering blow to the first rank. A fight ensued and eventually they were pushed back to the Thomas farm, but not before they had done some damage. Total casualties this day were around 2,000 dead and wounded. In 1860, Araby was purchased by Christian Keefer Thomas, a retired Baltimore dry goods merchant. 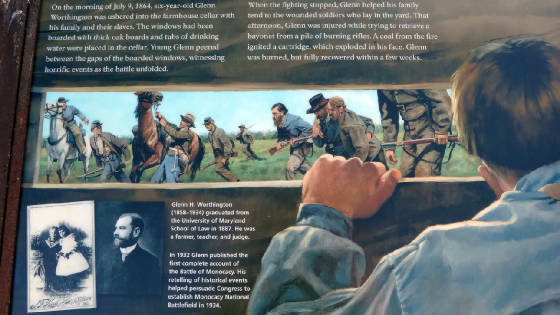 C. K. Thomas relocated to Frederick County to avoid Baltimore's pre-war strife; unfortunately, both Union and Confederate troops were actively engaged on Araby throughout the period of conflict. Pieces of shell were flying too near to be pleasant ... Minié balls slashed the shubbery, while the larger missiles of War's fearful instruments twisted huge limbs from the trees, leveled down chimneys, & tore out an angle of the house. 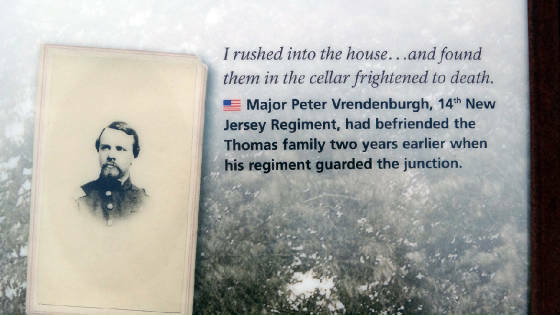 The Thomas family spent the winter of 1862-63 getting to know members of the 14th New Jersey Regiment, whose duty it was to guard the nearby Monocacy Junction. 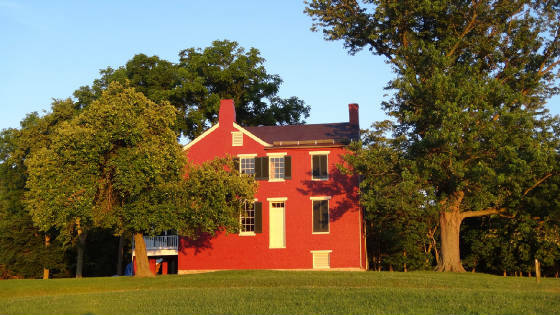 In June of 1863, Major General Winfield Scott Hancock established his headquarters at the Thomas home for three days while the Union army marched north toward Gettysburg, Pennsylvania.